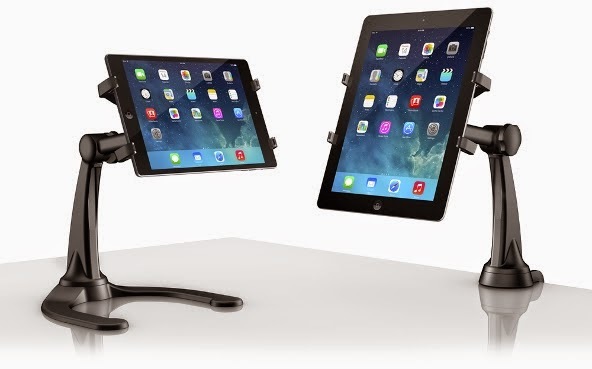 IK Multimedia, the leader in mobile music creation apps and accessories today announced iKlip® Xpand Stand its next generation expandable tabletop riser stand that lets you securely hold any iPad, iPad Air, iPad mini, Android device or any other tablet with a screen size between 7" to 12.1". Thin, wide, long, short - it doesn't matter the dimensions, iKlip Xpand Stand is designed to accommodate just about any tablet size without any kind of adapter required. It's the latest iteration of IK's popular iKlip line, which has sold nearly a quarter of a million units worldwide since its November 2010 debut. iKlip Xpand Stand features an expandable spring-loaded bracket design, four rubberised gripping points, a metal-reinforced base and an optional tabletop clamp. It's an all-in-one solution that's as useful for musicians as it is for small business owners, public speakers, professionals and anyone else who needs a sturdy way to secure their tablet for everyday use. At the heart of iKlip Xpand Stand is its expandable sure-grip technology, which allows it to accommodate a wide range of tablet sizes without the use of cumbersome adapters. iKlip Xpand Stand's grips can be extended to hold all tablets with screen sizes between 7" and 12.1" - from thick to thin and big to small, iKlip Xpand Stand has been designed to carry them all. It even lets you use many devices without having to remove their protective carrying cases. It also features a rubberised "soft touch" surface that provides a firm hold that doesn't scratch or mar your device's surface. iKlip Xpand Stand lets you position your tablet for the best possible viewing angle. It's a versatile system that can be used in two convenient configurations: You can set it on any table or flat surface thanks to its included ultra-sturdy, metal-reinforced thermoplastic base. Or, for an even more secure setup, use its optional tabletop clamp to secure it to a table's edge for a more permanent installation that's perfect for music venues, small businesses, lecture halls and other places where tablets are required. In all situations, iKlip Xpand Stand features a multi-angle ball-joint mount, which lets you adjust it for optimum ergonomics and easily switch from landscape to portrait with a simple turn of the hand. iKlip Xpand Stand makes it easy for musicians, public speakers, lecturers and other performers to bring their favourite mobile apps to the stage. It holds your tablet in the air with enough room to fit keyboards, mixers, DJ gear, notes and other tools beneath. It's an excellent stand for on stage performance: Now guitarists can use powerful real-time effects processors, like AmpliTube®. Keyboard players can play with a whole galaxy of virtual instruments and synthesisers, like SampleTank®, iGrand Piano™ and iLectric Piano™. DJs can enjoy mixing and other groove making apps, like DJ Rig™ and GrooveMaker®. Vocalists can have a clear view of their favourite singing and lyric apps, like VocaLive™ and the new iKlip® Stage. Orators and public speakers can now use their tablet for notes, entire speeches and presentation control right from the stage. But there's more to iKlip Xpand Stand than its performance potential. Its reliability is useful for a wide variety of business and professional applications: Small business owners can count on iKlip Xpand Stand to hold their tablet as a part of a point of sale system, as a time clock, as digital signage, as an interactive catalogue and more. And doctors, dentists, opticians and other medical professionals can use their tablets to display and hold vital medical information for patients in the office - In other words, iKlip Xpand Stand is an ideal tablet display stand for any industry. iKlip Xpand Stand is ready to go straight out of the box thanks to its iKlip Stage companion app. It's a streamlined music file management and page turning app with intuitive controls that makes it easy to import, organise and perform with music scores, lyrics, tabs and more. When combined with the flexibility of iKlip Xpand Stand, it creates a powerful, easy-to-use system that makes live performance a whole lot easier. Like all IK products, iKlip Xpand Stand has been designed and manufactured in Modena, Italy - a city famous for high-performance Italian industrial design. It has been made from a lightweight thermoplastic that's durable enough to last performance after performance and night after night. Each product goes through rigorous quality testing to ensure the utmost in dependability. IK Multimedia owns and operates its own manufacturing plants and uses only the best components, materials and processes to create solid, smartly manufactured products at an affordable price. iKlip Xpand Stand will be available in October from music and electronics retailers worldwide and from the IK Online store for $69.99/ €54.99 (excl. taxes). Pre-orders are now available on the IK online store and via selected resellers.